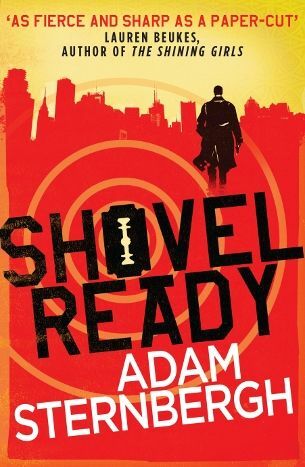 Shovel Ready book review . Noir thrillers never seem to go out of style – there’s something timeless about their bleak, fatalistic attitude, and they can be spliced successfully with almost any other genre. Shovel Ready uses this to its advantage, combining a noir attitude with near-future SF, resulting in a vividly violent tale of life on the edge. Set in a New York that’s been virtually abandoned in the wake of a series of terrorist attacks, it’s the story of ex-garbageman turned low-rent assassin Spademan, who uses his box-cutter blade for anyone who’ll pay. Things change, however, when he takes a job from a prominent evangelist, and ends up acting as a protector for a girl he was hired to kill. His search for answers leads him to virtual realities run by the super-rich. Adam Sternbergh’s debut novel doesn’t flinch from the brutality of his hero’s quest. The prose may be sparse, but the violence, when it arrives, is grisly and shocking, with the a distinct, hard-boiled tone that’s closer to writers like Cormac McCarthy. Admittedly, the SF elements are over-familiar, and Sternbergh ultimately falls a little short of the profound level he’s aiming for, but the book is never less than effortlessly readable, mixing razor-sharp wit with simmering tension. Provocative, gripping and sharply written, Shovel Ready is an admirably nasty thriller that demands your attention.